The Everlasting Slip Bobber - the world's finest slip bobber! Your old slip bobber doesn't work! This one does! Welcome! 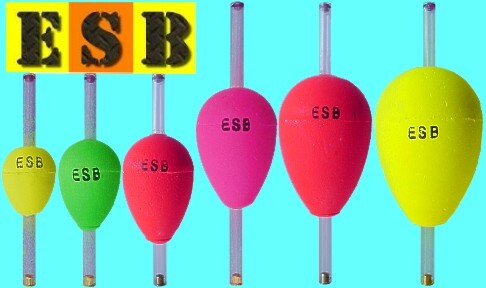 I created this site in 1998 with the primary pupose of marketing my great slip bobber, the ESB. But, there is a lot of other stuff here, too, so surf around and enjoy! BTW, as should be obvious, I'm a better fisherman than webmaster, LOL. The photos at right show the damage to a Brand X slip bobber that I actually used during the month of May, 1998, for weekend fishing on my native Houghton Lake, Michigan. 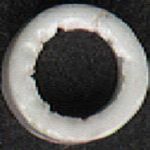 Note the deep cut at the bottom of the center hole on the plastic stop bead, and also how the terminal end is chewed up. The line I used was my personal favorite, 6 lb. 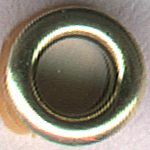 test TrileneTM XL monofilament. The float was set at a depth of 8 to 10 feet, baited with a 1/16 oz. jig. Remember, this damage was caused by mono; can you imagine what something like FirelineTM would do? Why should you care about this? Because using a float like this will prevent you from catching fish. Your line will become snagged in the cut in the stop bead, not allowing your bait to reach the depth you intend, and worse, you probably won't know it's happening. 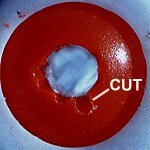 The damaged surfaces of the bobber will damage your line, causing you to lose fish through break offs. I know these things happen, because they've happened to me. And, if you use slip bobbers, chances are that there is at least one in your tackle box right now that looks about like this. That's why I invented the ESB, the slip bobber that works better, faster, longer, every time! For about the same price you're paying now for something that doesn't. The photos at right show the ESB glass stop bead and brass terminal end guard. I used this actual float for 4 months, with mono and FirelineTM. With it, I caught walleyes, bass, bluegills, sunfish, perch, pike, trout, and one 12 lb. salmon. As you can see, it's not in the least damaged. And if I hadn't cut it up so I could scan it for you, it would work as well tomorrow as it did the day I made it. Yes, it is a simple idea, but it produces the most reliable and fastest slip bobber in the world. This is not about having to plunk down a few bucks every couple weeks for new slip bobbers - it's about whether you can trust a simple piece of fishing tackle to do what it's supposed to do. How much is your fishing time worth? If you ever use slip floats, you owe it to yourself to click through the links below. Because if you're not using an ESB, you might not really be fishing. TRILENE and FIRELINE are registered trademarks of BERKLEY, INC.
ONE OF THEM IS RIGHT FOR YOU! Order secure on-line, by e-mail, or snail mail! The only place in the world that you can order exactly the sizes, colors, and quantities that you want of the most reliable slip bobber in existence! It's Here! The ESB Pro Staff Page! See what the pros think of ESB! Visit them at the links below. Testimonials, Reviews, and Photos from the growing ESB army! More evidence that you've come to the right place. Page design, text, photos, and logo copyright ©1998 - 2019 HL Outdoors. All gifs used in these pages are believed by the author to be in the public domain. Should any person register a legitimate complaint with HL Outdoors concerning the use of any gif, the offending gif will be immediately removed.